There are around 9,000 satellites orbiting Earth. Some satellites, such as the International Space Station carry a human crew. 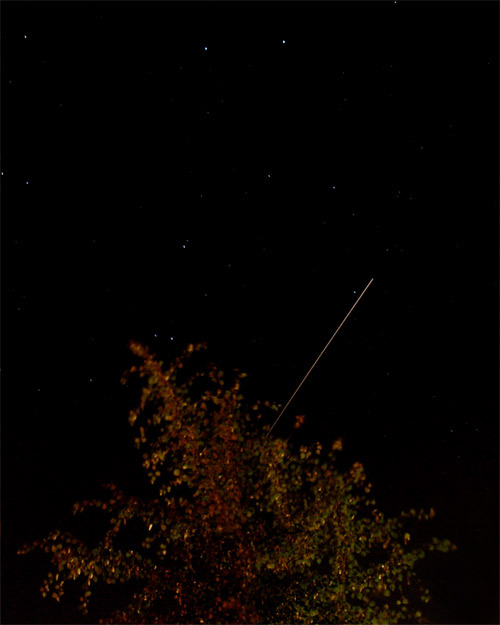 This page is devoted photographs of Earth's satellites and meteors. Whenever you see a satellite in the sky, it is rarely because there are lights on the satellite, but is because the sun is reflecting off of the satellite and onto your position. This is why satellites are only visible a few hours after sunset and a few hours before sunrise. At other times, the Earth blocks the suns rays above you and you won't see any reflections. Orbiting the Earth are 66 Iridium class communication satellites. Each of these satellites has 2 very large reflective solar panels. An Iridium Flare is the reflection of the sun off of one these panels as visible from your location. By calculating the exact altitude, speed, and path of the satellite, as well as the angle of the mirrors, you can determine the time and points on the Earth's surface where the reflection will be most visible. You can look up times and locations of Iridium Flares for your location (as well as International Space Station and other satellite pass-overs) at http://heavens-above.com/. Iridium Flares can get as bright as -8, bright enough to be seen is broad daylight, though these only happen at a given location every month or so. 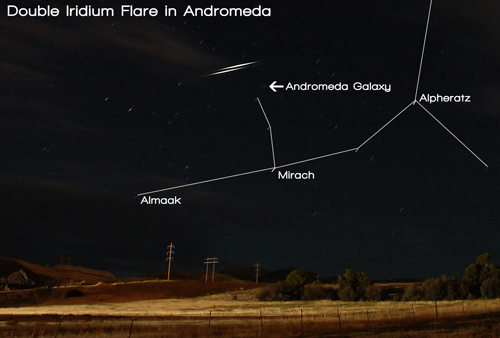 Iridium flares of -1 or brighter happen about every day or so. What is this object flying across the sky behind my quaking aspen trees? It is the International Space Station with the Space Shuttle Atlantis docked to it. At about 210 miles above Earth, the pair of space craft carry 10 astronauts at 17,500 miles per hour. The ISS makes it trip around the Earth in well under an hour. 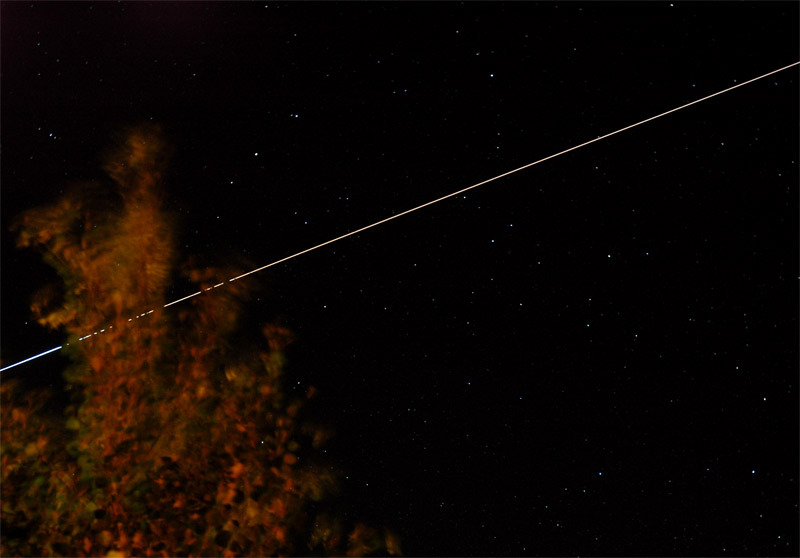 This image captures a relatively rare double Iridium flare, when two Iridium class satellites pass over in quick succession. The blurry looking 'star' just below and to the right of the flares is actually the Andromeda Galaxy. Iridium Flare (left) and a meteor (right). 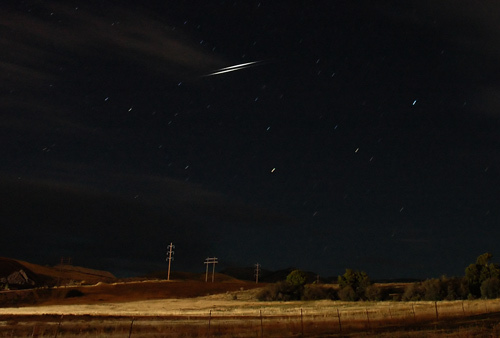 The Iridium Flare pictured above is Magnitude -6. To get a perspective, the bright star in the lower right is Altair (magnitude .77), one of the 4 or 5 brightest stars in my sky. Although I incorrectly guessed the position of the flare and only caught the last half or it, I also happened to capture a small meteor at the same time, something which I imagine is probably very, very rare! Wait, isn't a 'near miss' a hit??? Shouldn't it be called a 'near hit' instead? Hmmmm?!? 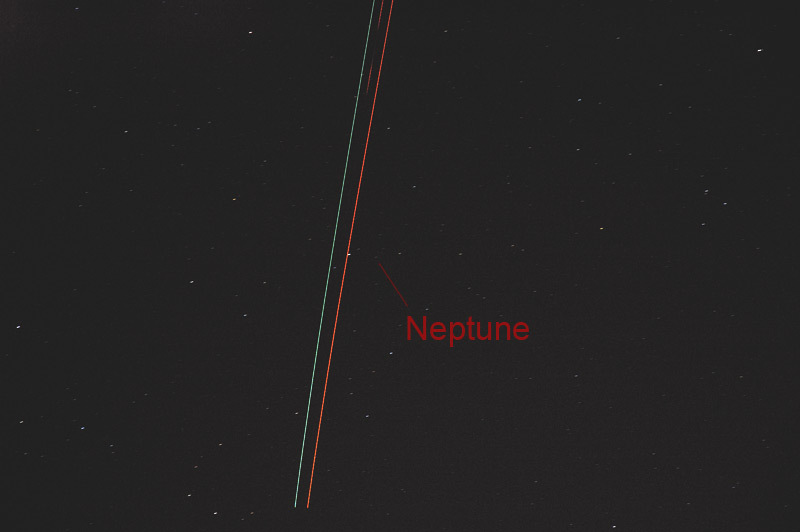 I was taking long exposure photographs trying to identify Neptune and Uranus when a plane flew through the exposure. Though none of the planet photos are worth posting here, I thought this one was interesting.